Deep-sea phone cable. © G. R. Leopold, 1961. My memories of working with Harold Edgerton go back to the early 1960’s, when AT&T was concerned about the vulnerability of its transatlantic telephone cables to damage or breaks caused by deep sea trawlers operating over the continental shelf off Newfoundland. As an engineer at Bell Telephone Laboratories, I was responsible for leading an “expedition” to explore the sea bottom, to locate the cables, and to determine the causes of the cable difficulties. brought his customary enthusiasm and interest to our project. comprised a very expensive viewfinder for the 35 mm camera. We called the 35 mm pictures “eggs,” after Edgerton Germeshausen and Grier, the firm that manufactured the equipment. suspended above the sea bottom, which made them vulnerable to bottom-dragging trawlers. 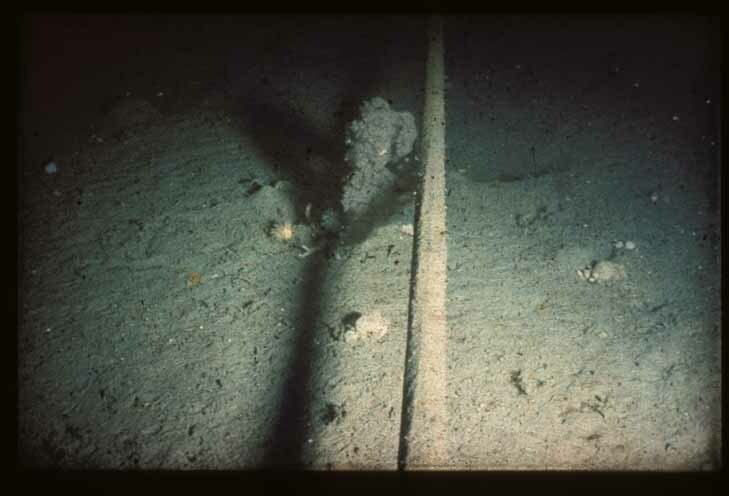 As a result, future undersea cables on the continental shelf were buried, using a towed, sensor-equipped plow designed by Bell Telephone Labs. fortunate group of students and a memorable teacher of great value. This entry was posted on Sunday, April 15th, 2012 at 12:19 pm and is filed under Personal stories. You can follow any responses to this entry through the RSS 2.0 feed. Both comments and pings are currently closed.